The Barbuta Helmet, also known as the barbute, was a visorless war helmet of Italian design. This helmet is simple and straight-forward, possessing a design similar to the classic Greek helmets of old, while providing just as much protection. This barbute helmet is a truly classic design, possessing a simple shape that none-the-less would have provided a great deal of protection. 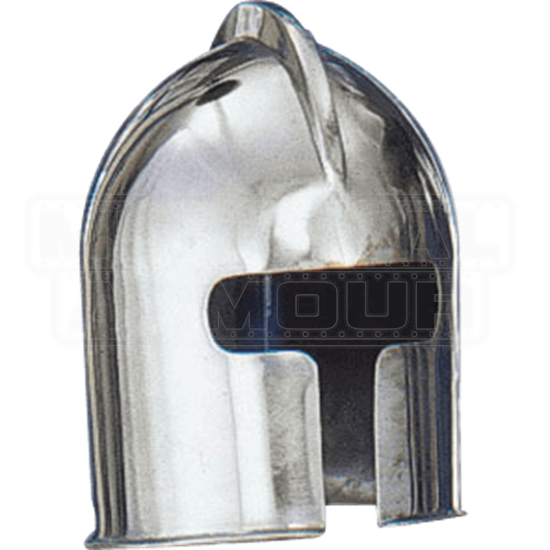 The helmet features a rounded crown that is set with a raised wedge, which helps to provide additional strength and reinforcement to the helmet without adding too much weight. The helmet extends down on all sides, protecting almost all of the wearers head and face entirely, leaving only a T-shaped section at the front of the helm open, which keeps the wearer ventilated and leaves the wearers eyes and face relatively open. This allowed for a wider range of vision, as well as an easier time breathing and communicating. This helmet is crafted almost entirely from high quality steel. Despite its relatively simplicity, the Barbute Helmet is a great piece to wear when you are about to march into a mock-battle or a LARP event, as well as a fantastic display item that features a good dose of authentic looking medieval style.